Freeness Matters! What Are You Missing? Drainac® Detector - The detector assembly consists of a 2" diameter, 316SS, vertical riser partitioned from the transparent acrylic tube by a 316SS perforated screen. The riser includes a 316SS full port ball valve for isolation and a stock line pressure transmitter. Within the transparent tube are 316SS conductance probes for filtrate level detection and a spray nozzle for cleaning the screen. Furnished with the detector are solenoid valves for control of flush water to the spay nozzle, tube / electrode wash, and under screen tangential swirl. The detector is hinged to provide screen access (24" minimum height required). Services required are flush water and air pressure at a minimum of 10 PSIG above the maximum stock line pressure. 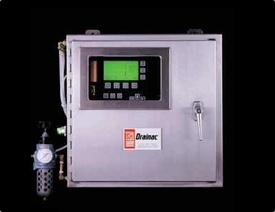 Drainac® Detector Control Panel - A stainless steel wall-mounted 20" x 20" x 6" NEMA 4X cabinet (floor-mounted pedestal optional) is provided for electronic and pneumatic support circuits, stock line pressure gauge, and detector tube pressure gauge. An industrial microprocessor provides level sensing, sequencing logic, blow down and flush time control, freeness calculation, automatic calibration, and graphic display of the information to the operator. An isolated output of 4-20 mA DC will drive up to 900 ohms of maximum load. Air filter / regulator with pressure gauge included. The cabinet will have external on / off switch and internal components tubed and wired, with user connections labelled. 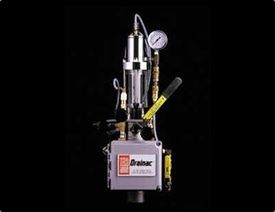 The Drainac® IIIB includes a very effective, simple engineering design to compensate for significant changes in process variables that can affect freeness, specifically, pressure, consistency, temperature, and pH. Normal changes in these variables for any given grade will have no meaningful effect on the instrument's ability to measure freeness. However, grade changes requiring a major shift in one or more of these four variables can easily and accurately be handled by Drainac® IIIB through the use of the multiple calibration characteristics. The microprocessor has the capability to retain up to (10) ten different setting and calibration parameters. Basic On-line Freeness Measurement – Basic on-line freeness measurement is used by production managers and paper machine operators as a “speedometer” of fiber quality enabling them to make real- time decisions that effect final production quality and paper machine runnability. Fast Sample Rate – 2-3 samples / minute allows for superior refiner control performance. Directly Measures Drainage Rate – calibrates to any freeness measurement, CSF, Williams Precision Slowness, Schopper-Reigler. Complete In-line System – no wasted product or sewered samples. Multiple Calibration Characteristics – for applications with different grades or furnishes. Self Cleaning System – minimizing maintenance and sampling errors. Simple Design – easy to use and understand. Low Installation Cost – the simple design allows for easy, cost effective installation. Call TECO today at 800-528-8997 and experience service SECOND TO NONE!